Somebody said that inflatable paddleboards (iSUPs) are the future. They weren’t wrong. Inflatable SUPs are better than traditional paddleboards in several ways. They are more convenient when it comes to traveling and storage and they are less expensive. Many people now prefer iSUPs to epoxy boards. If you are among those people, you are going to enjoy your paddling experience – no doubt. 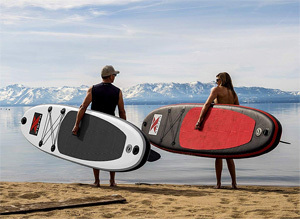 Users say that it is stable and fantastic on water… The Atoll inflatable SUP is one of the best iSUPs that you can get. There are very many inflatable board brands on the market today, and many more keep sprouting up every day. You may be wondering which board will serve you best or what iSUPs are most popular and why. In this article I review 15 of the most popular inflatable stand up paddleboards in detail to help you understand their pros and cons and decide which board to purchase. 10'6 x 31" x 6"
10' x 30" x 6"
10'4 x 32" x 6"
10'8 x 30" x 6"
Let’s take a closer look at these boards. The Atoll paddle board is a product of the Atoll Board Company. 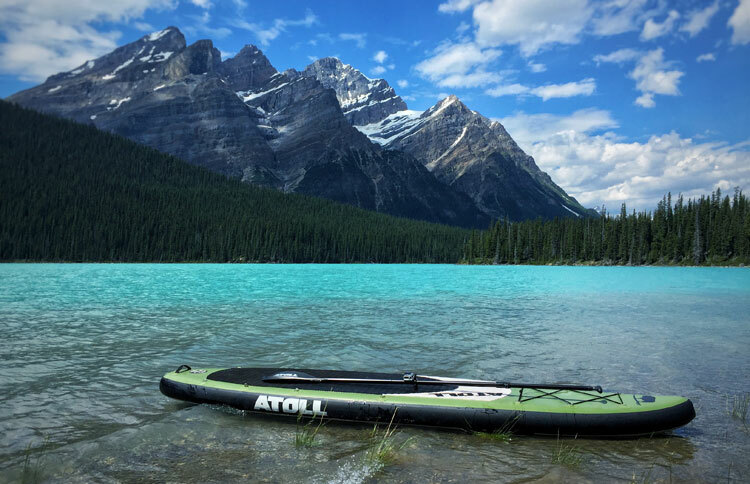 Founded by SUP practitioners, Atoll have managed to create – what I consider to be – the best inflatable SUP in this list. The Atoll is made from machine laminated dual layer PVC. This is the strongest and lightest iSUP material available. The dual layer PVC is very durable. Inflatable paddle boards made from this material can endure the regular wear and tear of SUP boarding much better than traditional hard boards or cheaper single layer inflatable SUPs. This board is also the lightest SUP in this list. At 19 lbs. 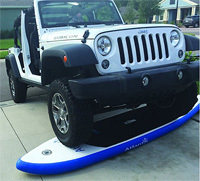 even younger or less muscular riders can carry this board from the car to the water effortlessly. When inflated up to 15 psi, the Atoll can carry a lot of weight. According to the manufacturer it supports up to 300 lbs. with ease. I’ve ridden this board with my nine-year old daughter – together we weigh close to 300 lbs. – without any issues like sagging or riding low in the water whatsoever. So I imagine that this board can actually handle quite a bit more. When I compare the Atoll with other paddle boards I’ve ridden, I find the Atoll to be easier to paddle. The tri fin design and shape of the board allows the board to also track well (to maintain course). 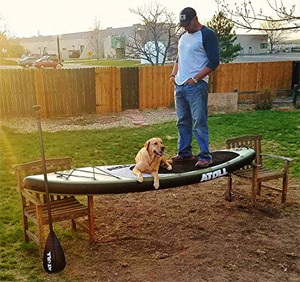 The large deck pad makes it an ideal board for paddling with a child or dog, for SUP fishing, touring, yoga or any other plans you have on the water. 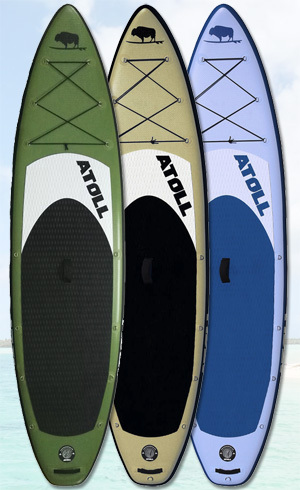 The Atoll paddle board is available in three colors: burgundy red, light blue and army green. The Atoll package includes the board, a dual action Bravo hand pump, nose and tail bungee tie downs, repair kit, leash, backpack, removable toolless fins and a lightweight adjustable 3-piece paddle. The bag is heavy-duty and large enough for all your gear. The board comes with a 2 year manufacturer’s warranty, covering any workmanship or material defects. If you’re looking for a high-quality, durable SUP board, that is easy to paddle and tracks well, the Atoll inflatable SUP is one of the best iSUPs that you can get. Some complaints about lack of attention to detail, but my board has no such issues. This board is highly rated on Amazon. Users say that it is stable and fantastic on water. They love that it comes as an all-inclusive package as it saves them a lot of trouble. Paddlers with dogs have no problem paddling with their furry friends. The Atoll inflatable SUP is one of the best iSUPs that you can get. The iRocker is such an awesome paddleboard. The measurements make it suitable for all kinds of SUP variations. At 32” wide, the iRocker offers enough deck space for moving around and keeping your belongings while still ensuring speed. It slices very smoothly through the water. It is board is 6” thick; you have no reason to worry about it submerging in the water. This paddleboard from iRocker comes as a complete package. 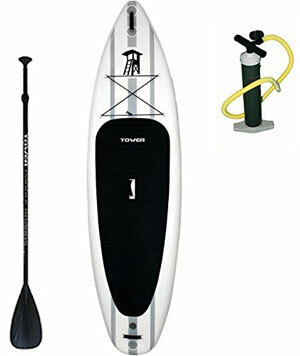 All the necessary accessories needed for standup paddle boarding are included—triple action manual pump, detachable center fin, carry bag, repair kit, coiled leash and fiberglass paddle. The fiberglass paddle floats on water. When you fall into the water you will not struggle finding it. The manufacturer made the carry bag with the end user in mind (evidently). The waist support and shoulder straps are padded for extra comfort. Generally, SUPers love the iRocker inflatable board. In fact, many of them highly recommend it (and the company as well). When fully inflated, it is very stiff; you would not differentiate it with an epoxy board. The accessories included are well-made and the manufacturer did put some thought into them. This Nixy iSUP is one of those high-quality paddleboards you keep hearing about. The makers over at Nixy Sports have used advanced technology to ensure that dents and dings will be the least of your worries. To prove that they are confident in this design, the manufacturers offer a 2-year warranty on the board. In addition to being heavy-duty, this iSUP is very light and only weighs 20 lbs. The Nixy Newport is available in five colors: aqua, blue, pink, purple and red. 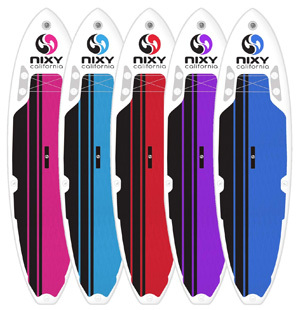 In the package, the Nixy inflatable board comes with all paddling accessories including a traveling backpack, ankle leash, adjustable aluminum paddle and a pressure pump. The deck space is sufficient given that the width of the board is 33”. There are also 8 D-rings for attaching your luggage. Other additional features include 3 fins to help with tracking and an optional kayak seat. There are barely any negative reviews on the Nixy iSUP. The backpack and the accessories that come with it are among the things that the users appreciate the most. They love the price. In the water, this board glides very nicely. It feels very stable and sturdy. The only complain was about how hard it is to inflate this board using a manual pump. 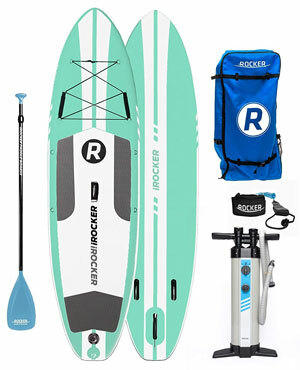 The stylish all round iRocker SUP from iRocker is bound to make you love paddleboarding even more. Besides being well constructed and durable, this board looks amazing and you will attract many envious stares and attention. With its extra wide tail and 6” thickness, this iSUP is very stable and can support a maximum of 350 lbs. It is also ideal for beginners. Just like the Atoll, the iRocker also comes as an all-inclusive package. Inside you will find a 3-piece paddle, an iRocker pump, leash and a backpack. They did not include a repair kit— maybe because they trust their products. The fiberglass paddle weighs half as much as an aluminum paddle to protect you from fatigue. There is no way you will chip its blade (even if you try) since the edges are made of strong rubber material. With the optional kayak blade, you can always convert it to a kayak paddle when you need to. It is wider than most boards and this limits speed a little. The general feedback for the iRocker Inflatable Cruiser is positive. Most users say that their package arrived promptly and well packaged so iRocker’s customer service is great. The board is stable on water. More lovable features include the durability of the material, its lightweight and safety line for windy/rough days. The Expedition iSUP is more suited for long SUP tours. It is meant to offer convenience that makes trips easier. First, Isle Surf & SUP have used their awesome Fusion Lite construction to give you a very light board that you can carry wherever you want. Regardless of where you want to go on your expedition, no condition will damage this board. You can take it to the stream, river, lake or ocean and not worry about obstacles leaving dents and dings. The deck features a diamond traction pad to not only keep your feet comfortable, but also prevent you from slipping on the wet board. The pad is pet friendly and you can have some fun time with your furry friend. There are two storage bungee systems, both at the nose and tail for all your storage needs. The Isle Expedition is available in two colors; aqua and moss. The paddling package comes with all you need. In the box you will find a backpack, paddle, high pressure pump, detachable center fin, coil leash and a waterproof case for your phone. Everything is color-matched with the board. 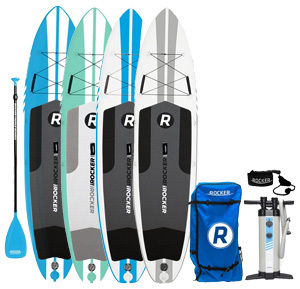 Both the board and paddle are light and if you are the kind of paddler that moves around a lot you will love this package. It is easy to inflate the Expedition to maximum PSI using the provided pump. The storage system is enough for all paddling essentials – something that SUP touring enthusiasts appreciate. All users seem to agree that everything about this iSUP is awesome. The Thurso Surf Waterwalker from Thurso Surf is an all-round paddleboard that is suitable for all kinds of paddlers and all water conditions. The top layer features military-grade PVC and underneath is a Dropstitch internal fabric. The outcome is a ding-proof board that can handle whatever you throw at it. Besides being lightweight, it has a unique wood stripe that enhances the board’s appearance and it will stand out among your friends’ boards. Take a look at what it has to offer. The Thurso Inflatable has a general positive feedback from the users. They seem to love everything about it. The pump works just fine and it is stable. The cooler bag that comes with the board has also been mentioned in the positive reviews. This is another quality product from iRocker with even better qualities. The iRocker inflatable has been made with so much skill and expertise, making it one of the best iSUPs in the market. It has a triple layer of state of the art PVC. It is tough and will serve you for a very long time. Its maneuverability, stability and speed will have it performing amazingly regardless of the water conditions and your skill levels. 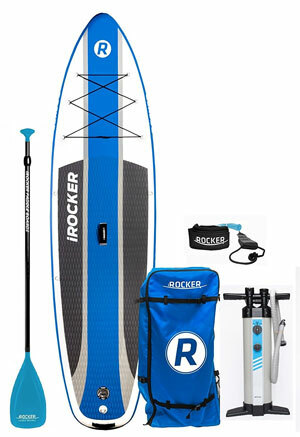 iRocker put everything in the box so you do not have to spend more money buying paddling necessities. They offer a fiberglass adjustable paddle (adjustable 67-79”), a high-pressure dual action pump, a slide in center fin and a backpack. The provided dual action pump does a fantastic job and makes it very easy to inflate your paddleboard. Pumping with the dual action then the single action when the PSI increases will ensure you are not too burnt out to paddle after manually inflating your iSUP. Riders love the iRocker All-Round paddle board. It has proven to be as stable as advertised, even for SUP Yoga. It is also highly portable and light; paddlers really commend it for this. 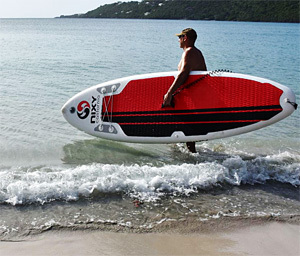 Xterra pride themselves in designing boards that suit their customers’ needs. The Xterra 10′ premium paddle board is made with an eye for detail. It is made from military Dropstitch material and you are guaranteed of enjoying your inflatable for a very long time. It offers stability and sturdiness, comparable to that of an epoxy board. According to Xterra, the Xterra iSUP can stand anything; from falling off a car roof to being run over a vehicle. It is 6” thick and offers you enough stability to learn and do SUP Yoga on. It can support up to 200 lbs. The Xterra 10′ is available in three colors: white, red and black. The black and red versions weigh 25 lbs. resp. 29 lbs. and support riders up to 250 lbs. These boards have a dual-layer construction on the top and bottom for extra strength and durability. The white version is lighter than the others because of its single-layer construction on the top and bottom, and double-layer on the side. The white board only weighs 16.5 lbs. and can carry up to 200 lbs, making it an ideal SUP board for lighter riders. Xterra includes all paddling necessities in the box, among them, a board, repair kit, backpack, removable center fin, adjustable paddle, a double action pump, D-rings, a 10′ coiled leash and a GoPro mount. Weight: 16.5, 25, 29 lbs. Capacity: 200 lbs and 250 lbs. 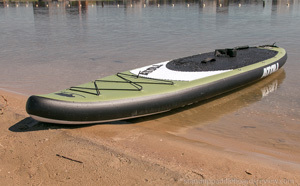 The Xterra 10′ iSUP has attracted a lot of positive reviews. The users are finding it stable and of good quality. It inflates and deflates fast. They describe using it as fun to ride on. There are a few negative reviews from customers who received defective boards. As the name suggests, the Explorer is a board for the adventurous SUPer. You can get it in two versions; the 11′ long one and the 12′ long one. The longer board is better if you want more deck space and will be faster than the shorter version. However, it also means that it is harder to control. Both boards are 6” thick so bending in the middle and being submerged in water are two things you will never have to worry about. At 32” wide, there is enough space for you to move around and bring a buddy along. The Isle Airtech Explorer package is all-inclusive and includes a high pressure pump, paddle, fin, leash, carry backpack and a manual. The paddle is made of carbon, something that most iSUP bundles do not offer. Carbon paddles are very light and great for long SUP tours. They are also great for kids who cannot handle heavy paddles. Other features include two carry handles and two bungee systems on the deck for all your belongings. For a board its size, the Isle Explorer is very easy to inflate. According to most reviews it takes about 5 minutes with a manual pump. The iSUP is stiff and no one mentions cases of it sinking in the middle. The accessories are not cheaply made. In general, users agree that the Explorer paddle board is worth its price. The Tower Adventurer does not compromise stability just because it is inflatable. It is 6 inches thick and can hold medium-sized to larger riders without bending. This increased thickness makes it a great choice for beginners and SUP Yoga enthusiasts. If you want to teach your kids paddleboarding or you are just starting out, the Tower Adventurer is a good option. Its maintenance is simple – even for someone who knows little about SUP boards. Almost all modern inflatable paddleboards are built of military-grade PVC material with Dropstitch construction and this one is no different. With this board, dings and dents will be the least of your worries. Tower Adventurer offer a great package deal. In addition to the board, they include a pump, fin and a three-piece fiberglass paddle in the box. Generally, users love the Tower Adventurer 2 iSUP. The rigidity is as advertised; it is just like a hard board. Paddlers also say that it is indeed well made and its maneuverability is something to write home about. The few existing negative reviews are from users who received faulty boards. 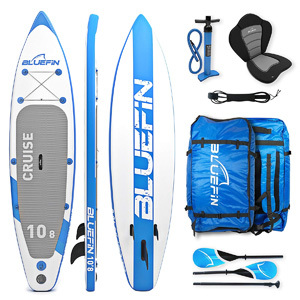 The impeccable Bluefin iSUP can serve as both a paddleboard and a kayak. It has been built using military-grade PVC for maximum durability and strength. This board can be used by all kinds of SUPers for all kinds of activities; Pilates, yoga, racing, white water boarding, touring and surfing. 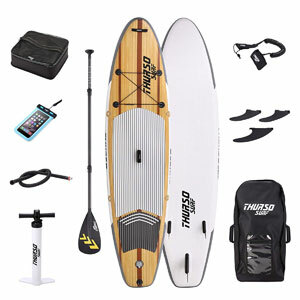 The accessories included in the package are kayak seat, repair kit, detachable fin, board leash, carry bag, 3-piece paddle and a dual action pump. 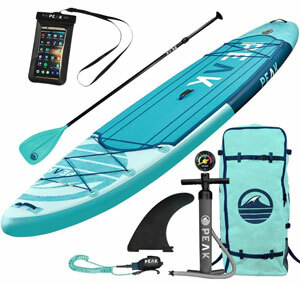 The SUP paddle can be converted into a kayaking paddle, and the conversion kit is included in the package too. Although this paddleboard is cheaper than most iSUPs, users confirm that it is still of very high-quality. All the included accessories, and especially the bag, are well made. Paddleboarders are happy that they can kayak and SUP without having to buy two different products. The Driftsun iSup is a very affordable paddle board for the amazing quality it provides. 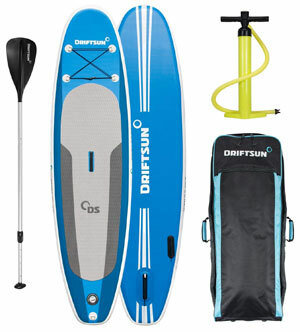 The Driftsun 10′ x 32” x 6” iSup comes with everything you need in its package. The board is in the shape of a traditional longboard style and has a sky blue surface with a four D-ring bungee on the nose of the board. The Driftsun logo is located on the rear as well as on the front center. A large grey single traction pad is attached to the surface and the board includes three fins for maximizing stability and control. The Driftsun Paddle Board quickly inflates and deflates full under five minutes and weighs only 23 Ibs. Its rigid construction and superior military grade drop-stitch interior can hold weight up to 300 Ibs. It has been said that when fully inflated, it resembles the texture and performance of a fiberglass board. A center handle is equipped for easy carry along with front nose and rear tail straps for assistant transporting. Great beginner board, superior thickness, extremely light weight, multiple grab handles. One size and one style. 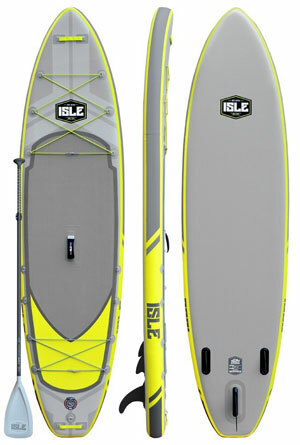 Most of the 2018 Isle Surf & SUP inflatable models have been made using the Fusion Lite Construction. This construction makes super light iSUPs while maintaining top-notch quality. The Isle Airtech for example is 30% lighter than competing models. Like many other inflatable boards, this one is not meant for a specific purpose so you can use it for whatever you feel like – as long as it is on water. All family members, regardless of skill level or size will find this iSUP comfortable. As pointed out above, the quality of this board is impeccable. You can easily find videos of people throwing it off a roof and running it over with a car on the internet and it does not even sustain a scratch. The Isle Airtech Inflatable comes with a backpack, pump, paddle, leash, fins and a repair kit. This is the complete paddling package. The paddle is adjustable and can be used by paddlers of different heights. It breaks down into three pieces to fit in the bag for transport. The tri-fin system helps with tracking and the bungee system on the deck is very convenient when you need to carry a few things into the water. Paddlers cannot appreciate the all-inclusive package enough. It saves a lot of time and money because they do not have to make any extra purchases. The iSUP is easy to inflate to 15 PSI which is the maximum PSI. Although a SUP electric pump does make the process effortless, the pump included does a great job and you should be done in five minutes or so. Ten Toes inflatable boards have a reputation for being virtually indestructible. It is made of military grade PVC which makes it withstand tough situations without getting dents and dings. 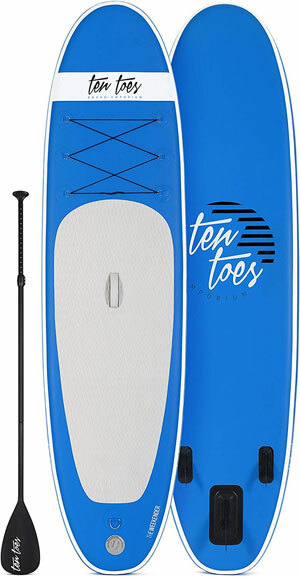 The Ten Toes weekender works just as well as a hard board; the only difference is that a Ten Toes inflatable offers more convenience and benefits. The manufacturers want you to get to paddling without wasting time making extra purchases; that is why they include all necessities in the box. In the package you will find, an inflatable board, a lightweight aluminum paddle, three removable nylon fins, a high-pressure hand pump, a nylon strap, a repair kit and a handbook. The Ten Toes Weekender is a board for all skill levels and all water conditions. It supports up to 275 lbs. It is totally approved for dogs too because of the soft deck pad – no need to leave Fido behind next time. Users have given this board a lot of positive reviews. According to some riders, when the Ten Toes Weekender is fully inflated you can mistake it for an epoxy board. It is sturdy and stable. A few people complain about how difficult it is to inflate this board, but an electric SUP pump would solve that. 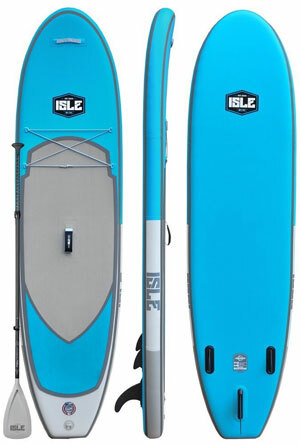 The Peak Inflatable SUP is a product of ISLE Surf and SUP. They are passionate about water sports and are well-known for making quality boards. Like most other inflatable paddleboards, the Peak board has been built with military-grade PVC material. The material is very strong and ensures durability. It comes as a complete package. 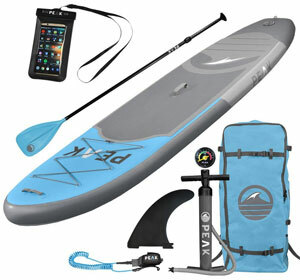 ISLE Surf and SUP include the following in the box; a board, a high-pressure pump, paddle, coil leash and a carry backpack. There is a six-point mounted bungee system for you to store your gear. There is also a nose handle that makes carrying your board easier. Some complaints about the strength of the seams. According to the users, the Peak inflatable is worth spending your money on. It is stable and high-quality. They also commended ISLE Surf and SUP for including a bag and other accessories in the bag. A few users are complaining about the seams. All the above iSUPs are great. As you have seen from their features, they can all give you a great paddling experience. However, they differ in small ways; for instance, some boards come with more accessories in the package than others. The dimensions also differ, giving you different SUP experiences. Hopefully, this article has helped you make a wise choice and so that you can get yourself a board that you will love. Should You Buy An Inflatable Stand Up Paddle Board? When inflatable paddle boards first entered the market there were concerns about their durability and rigidity. For some people the concept of inflatables made them think of rubber ducks and children’s floaties. Since then inflatable paddle boards have shown the error of these misconceptions, and have deserved a reputation as a great compact, lightweight, durable and often cheaper alternative to rigid paddle boards. This is probably the main reason why inflatable SUP board were ever made. Unless you live right by the water or own a large vehicle, transporting a rigid paddle board is often a pain. Not so with inflatable paddle boards. When rolled up they are often no larger than a sleeping bag. So bringing one along while traveling is easy enough. And storage isn’t an issue either. Any shelf space will do. Inflating and deflating these paddle boards does take some time and effort, but is usually seen as part of the work out experience. And an electrical pump can make this process easier as well. Have you ever tried to carry a solid paddle board? Well, no such problems with the best inflatable paddle boards. They are generally much lighter. Often weighing less than 30 lbs. For instance, the Atoll paddle board above only weighs about 19 lbs. So you can take an inflatable paddle board with you on a plane ride without worrying about extra airline fees. And carrying one from your vehicle to the water and back is no backbreaker any more. This is the most often asked question people have about inflatable SUP boards: “Can they carry my weight?” With the right size paddle board, of course they can! Some of the cheaper or thinner paddle boards may bend or sag in the middle, or may even sink beneath you. But the better quality inflatable paddle boards are usually just as rigid as their solid cousins. And since they are filled with air, inflatable paddle boards usually also have a lot of buoyance and a larger weight carrying capacity than a similar shape rigid paddle board. This is another question people often have of inflatable paddle boards: “Are they durable? Won’t they spring a leak when I bump them into a rock?” The fact is that most inflatable paddle boards are made from heavy-duty, military grade materials and can take a lot of abuse. Epoxy foam is very strong. And double layers of PVS stitched together with drop stitch construction make them withstand almost all bumps and scratches. In fact, because of their inflatable nature iSUPs are often a bit more forgiving then their traditional fiberglass cousins. When you ding a rigid paddle board, the fiberglass is not as flexible, so a solid board is more likely to crack and chip. However, the more flexible materials of an inflatable stand up paddle board can take the impact much better, making them often the better choice in rocky conditions.